“Please tell him to leave and come back when we’re finished,” she said. He smiled and grabbed an ear of corn with one hand. 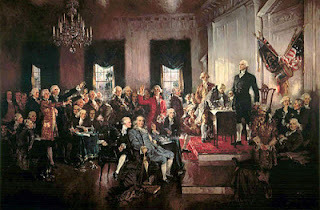 The other held a pocket version of the U.S. Constitution which he studied with interest. I stopped a plate that she had slid toward me before it landed my lap. “Is this true?” I asked him. “Hmm,” he said. “Weird.” Then he began making machine gun-like noises as he nibbled down the length of his ear of corn. “That does it,” my wife said. “You two have fun. I’ll be in the living room.” With that, she gathered her plate, utensils, and water glass, then left us at the table alone. “Don’t call our Constitution a joke,” I said. He reached into a coat pocket and retrieved a dollar bill. Slamming it onto the table, he pointed at the slogan, “In God We Trust.” When I didn’t respond, he put it back into his pocket. “And what about this Article Six thing?” he said. of work for a bunch of aged white men. - C.W. I ate in silence until he placed the document gently on the table.